Nukazuke is a type of Japanese traditional pickling that requires a special kind of mash that is made from rice husks and a number of other ingredients. This mash is called nukamiso. 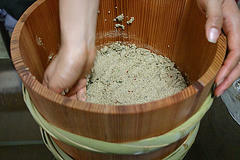 Some nukamiso is very old and it requires a special touch and constant mixing to maintain the special flavor. Vegetables are typically stuck in the nukamiso overnight or for the day. I wrote a Nukamiso guide was which I last updated in April 1999. Since then, I have moved twice and in the process, killed my poor nukamiso. My original nukamiso seeded from three 50 year old nukamiso's and a 25 year old nukamiso, two from Kyoto and two from Tokyo. Killing it was an unforgivable sin. Since then, Mizuka and I have felt so guilty, that it took a lot of courage to decide to start up again. The trigger was receiving a batch of the best eggplant nukamiso that I've ever had. The container contained a healthy amount of the nukamiso in addition to the eggplant and the instructions suggested that you could seed your nukamiso with this. We tried some vegetables from our garden and it was excellent, so we went and got a cedar tub today. In the past, we lived in western houses so one of the challenges was keeping the nukamiso as cold as possible in the summer. This was partially the cause of the demise of our last nukamiso. This time, we now live in a traditional Japanese house has an opening to the space under the kitchen. Japanese houses typically store pickles and other things that need to stay cool in this space. Unlike doing nukamiso from purchased vegetables, we will be able to feed our nuka-chan with fresh home grown veggies. I just Flickr'd some of the pictures. Wow, this is so cool! It looks great. It sounds a bit like making sourdough bread -- nukamiso uses a starter. This makes sense, as the organisms that make vinegar are very varied and specific to their environment. I have a big garden and do some pickling, but here in the US most people who do pickling just use commercially made vinegar, which is fairly uniform, and no one that I know of has attempted to save some of the pickling solution as a starter for another batch. I love it when people post descriptions of the stuff they make at home. Ahhh, lovely! I'd always wondered what kind of pickles Tampopo was making at the start of the movie by the same name. It sure seems like a nukamiso pot to me, now that I know what one looks like. I hope your new batch goes well! The right and wrong of one's way of doing things are found in trivial matters. I have found an intresting website. I wonder to know is it in Japanese and what is it about. My mother (Eurasian) shocked all the fabulous ladies of Tokyo society by doing her own nukamiso mixing. She never let the maids touch it. I used to watch her and she taught me how to do it. I thought (like most kids) that Mother's was the best. I used to worry my Caucasian Dad, the maids and even my mother because my favorite food was ocha zuke eaten with nuka miso zuke. Every day same basic rice format with different pickled vegetable. Ummmmm ze best! Still, they worried that I was going to be malnourished. Maybe there was some truth to that but my mother's miso shiru was also the best. She was wonder woman to me. Japan and Europe blended into an elegant and practical woman - chic, intuitive, intelligent, sensitive, humorous, wise and dead. Nothing lasts forever. i don't know is nuka can last forever...my mother used to start by making a new batch every year. She had a formula and I know it from having watched her. It was one of the things she told me you just have to know how to make. Same goes for flower arrangements, etc., etc. if you are familiar with classical Japan, you know what it means to come from a good family and simply knowing the complicated rituals intrinsically. The other thing about my mother: she lived her truth and was a delightful iconoclast. So, there was and is plenty of room for debunking the useless or the snooty, obnoxious, formalism. It doesn't matter where you come from or where you go. If you are a good, loyal, honest, sincere friend, you rise to the top of my list of people I want to know. (That also means, if you are the converse, please do not ever, never, contact me for any reason what-so-ever). And this is NOT a "chat room intro or request for conversation!! - this IS a nukamiso notation, and a story about how the topic of nukamiso brought about one of my favorite memories of my childhood, food i.e., nukamiso, and my fabulous, fashionable mother who never found it below her to DAILY work the nukamiso with her long beautiful manicured fingers - I say that because it is all so atypical of the traditional Japanese notion of the farm or rural woman making and working the nukamiso. Her friends were always shocked that she worked our nukamiso hherself and made it from scratch -- and oh soooo deeeelicious. Her friends used to ask to have our pickles served even with tea. Signing out: Aeliot of Amnesia OmniMedia "Hello," especially to Joi, the site host. God bless everyone. What i like, wish you'd blog about, is NIGORI-ZAKE. YUM! I have Kefir grains and Manchurian mushroom for Kombucha Tea. I would truly appreciate some starters for the above, and instructions. I also would treasure down to earth instructions for Water Kefir. So many wonderful things if we could but find them and share them. I am new to the process of nukazuke. In the initialization you advise to add kombu, chili and even dried shitake, but you don't say to remove it. Should it be left in there forever, or just the duration of one pickling cycle? Joi Ito - "Nukamiso redux" by Joi Ito is licensed under a Creative Commons Attribution 4.0 International License.